Vrat wale aloo ki sabzi recipe – This is potato side dish made in pressure cooker for vrat or fasting. Peanuts are added in the recipe. It gets boiled along with potatoes in the cooker. So peanuts become soft yet slightly crunchy. This adds nice crunch to the dish. 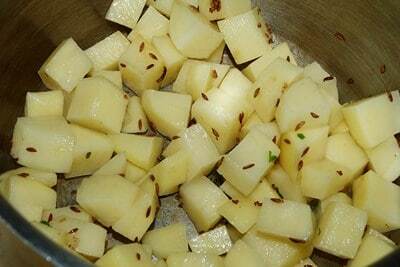 This vrat wale aloo can be eaten on any other fast as well like ekadasi, maha shivratri, janmashtami or gauri vrat. Navratri is just started by today. It is 9 nights and 10 days festival. In this festival, people worship the ‘Matarani’. And many devotees observe the fast on these 9 days. 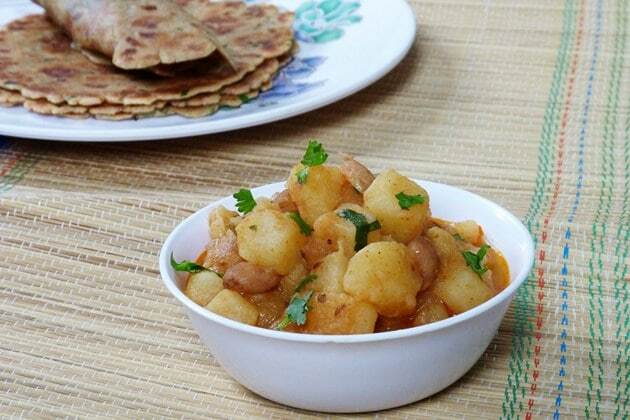 I also keep the fast and on the first day I have made this aloo ki sabzi and rajgira paratha as a meal. It was filling meal. Potato is the most commonly used in any dish during the fasting whether it is vada or thalipeeth or paratha or puri. Potato is added in almost all the recipes. 1) Heat the ghee in a pressure cooker on medium heat. Once hot add cumin seeds. Let them sizzle then add chopped green chilies and saute for few seconds. 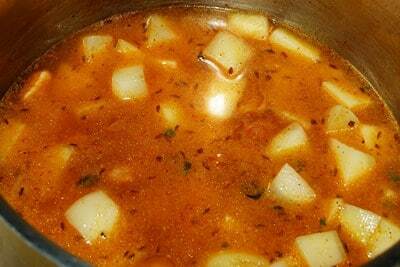 2) Add cubed potatoes. Mix it. 3) Then add peanuts, salt and red chili powder. Mix well. 4) Add 1 cup of water. Stir it well. 5) Cover the lid, put the weight on. Let it whistle 3 times on medium heat. Then turn off the stove. Let the pressure go down by itself and open the cover. 6) Using back of your spatula, mash few of potatoes for thicker gravy. Garnish it with chopped coriander leaves. 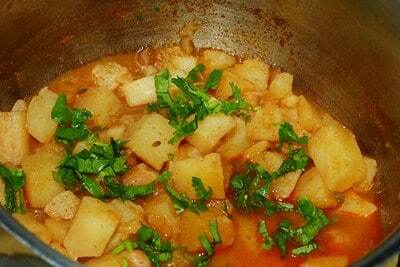 Aloo ki sabzi is ready to serve. As it cools the gravy will thicken. If it is rested for an hour or so, all the gravy will be absorbed by the potatoes. Serving suggestion: During the vrat, it can be served with rajgira paratha or kuttu ka paratha. 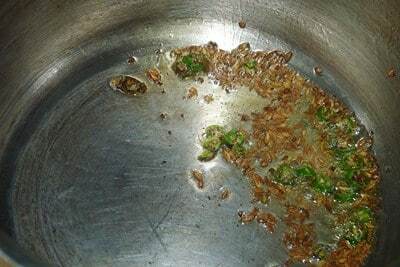 It can be served with rajgira puri, singhare ki puri or kuttu ki puri. Once hot add cumin seeds. Let them sizzle then add chopped green chilies and saute for few seconds. Add cubed potatoes. Mix it. Then add peanuts, salt and red chili powder. Mix well. Add 1 cup of water. Stir it well. Cover the lid, put the weight on. Let it whistle 3 times on medium heat. Then turn off the stove. Let the pressure go down by itself and open the cover. Using back of your spatula, mash few of potatoes for thicker gravy. Super delicious subzi,just love to have it simply with some rotis. 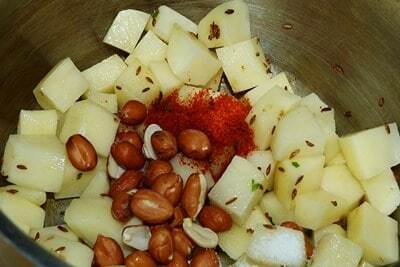 in normal days when i make aloo sabzi i vary it with peanuts and it gives it nice crunch. I already mentioned in ingredients list that I used sendha nakam (Rock salt). I will add that coming up pic soon. 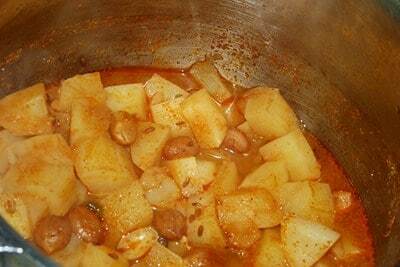 very nice recipe Kanan, i have never added peanuts to aloo sabzi,i am going to try this out..looks yum!